Revised Edition of two Classic WWI Designs! 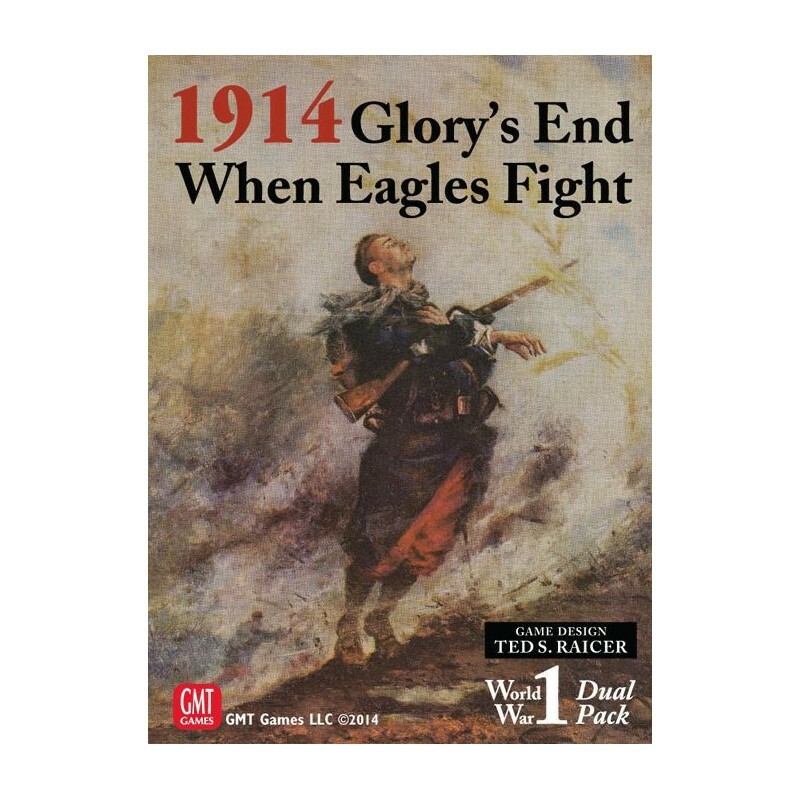 1914: Glory's End covers the Western front in Europe. When Eagles Fight covers the Eastern Front in Europe. In August 1914, Imperial Germany gambled its future on a rapid conquest of France, designed to free up the German army within six weeks to face the Russian steamroller of France’s Tsarist ally on the eastern front. Seven German armies deployed opposite five French armies, the army of “plucky little Belgium”, and the “Old Contemptibles” of the British Expeditionary Force in a series of battles that turned August and September 1914 into the bloodiest months of the entire war. 1914: Glory’s End covers the first three months of the Great War on the western front, from the Guns of August to First Ypres. This oft-gamed campaign receives a unique treatment, emphasizing playability without compromising on historical feel. Units are mostly corps of four steps (two counters per unit), along with a few especially strong (or weak) brigades and divisions, along with counters for the feared German Krupp and Skoda guns. The corps level Order of Battle accurately reflects the operational doctrine of the campaign, while also limiting the number of counters on the map to an easy-to-manage level. The game scale is 9.5 miles per hex and three days per turn. The campaign game runs a full 30 turns, but the new edition will include not only a previously published mini-scenario on the Battle of the Marne, but a short ten turn campaign scenario covering the decisive opening weeks of the war. In addition the campaign games can be played in historical or free set-up versions. 1914: Glory’s End uses an Igo-Hugo system with two types of combat to demonstrate the tactical realities of the campaign: Prepared Combat and March Combat. Prepared Combat allows you to bring all your adjacent units to bear against a defending hex, but only with units that don’t move. This gives the defender time to reinforce, retreat, or pre-empt your combat with his own attack. To avoid this, you can “attack off the march” during your movement, but March Combat may only be delivered by a single stack at a time, limiting the force you can bring to bear. Furthermore, March Combat cannot be used against entrenched enemy units. The coming of trench warfare is reflected by a unique Entrenchment rule: starting on turn 10 players may entrench one or two hexes per turn, PLUS any hexes adjacent to enemy trenches. The result is that trenches appear first as a tactical consideration, but then turn into a strategic problem as they spread with ever-increasing rapidity along the front. 1914: Glory’s End manages to cover all the important characteristics of the campaign (with rules for forts, cavalry, command and control breakdowns, supply, strategic rail movement, Allied sea movement, German forced marching, Plan XVII, Paris in Danger! and more) while remaining easy to play. The new GMT version will of course incorporate all errata from the original edition, but adds updated artwork, a corrected historical campaign Order of Battle, additional scenarios, and a tweaked set of rules. When Eagles Fight recreates this titanic struggle from the initial clashes at Tannenberg and in Galicia to the revolution that brought down Tsar Nicholas II. The large-hex map covers the eastern front of the Great War from the northern tip of Romania to Petrograd, and from Berlin to Smolensk at a scale of 25 miles to the hex. Turns represent one or two months, and combat units range from division to (mostly) corps. When Eagles Fight has a set of low-complexity rules, without sacrificing the historical elements of this unique theater of the Great War. The combat results table is bloody and attritional, but allows for breakthroughs with the right tactics or artillery support. The greater operational skills of the German army is shown in the use of the OberOst HQ, which allows additional attacks on a select part of the front. The Russian supreme headquarters, Stavka, in turn has the ability to concentrate their limited supplies to overcome logistical shortages. And the surprise tactics of the Brusilov Offensive can allow a late game victory over the Austrians. Other rules cover the slow pace of Russian mobilization, Austrian Lock-Step Planning in the opening days of the war, German heavy artillery, fortifications, Russian Guards forces, Cavalry Retreats, and the effects of events on other fronts. But the new edition of When Eagles Fight is more than just a reprint of the original version. The Random Events Table has been exchanged for a system of random events chits allowing for more events. The effects if the Germans do not launch a Verdun offensive in France-which sometimes threw off the balance of the original design- have been revised. Changes in the stacking rules after 1914 more accurately reflect the effect of trenches on the course of the campaigns. And the map now contains the rail lines removed by Command from the first edition. The game also includes a short alternative-history scenario in which the bulk of the German army goes east rather than west in August 1914. These changes make this an improved edition of an already award-winning design. 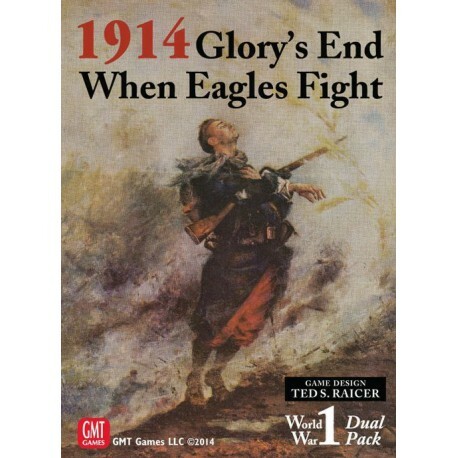 Tense, historical, and just plain fun, When Eagles Fight is a game that belongs in the collection of everyone with an interest in the Great War!